One of the first things that grabs people’s attention when they begin using SaaSPulse is our real time User Activity Stream. 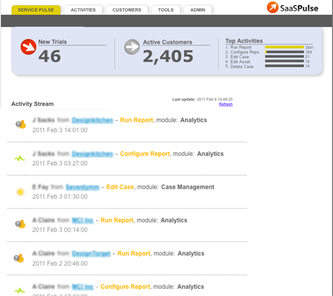 Service Pulse is a global view of all activities on a customer’s web-service. The view updates in real-time as new events are received. 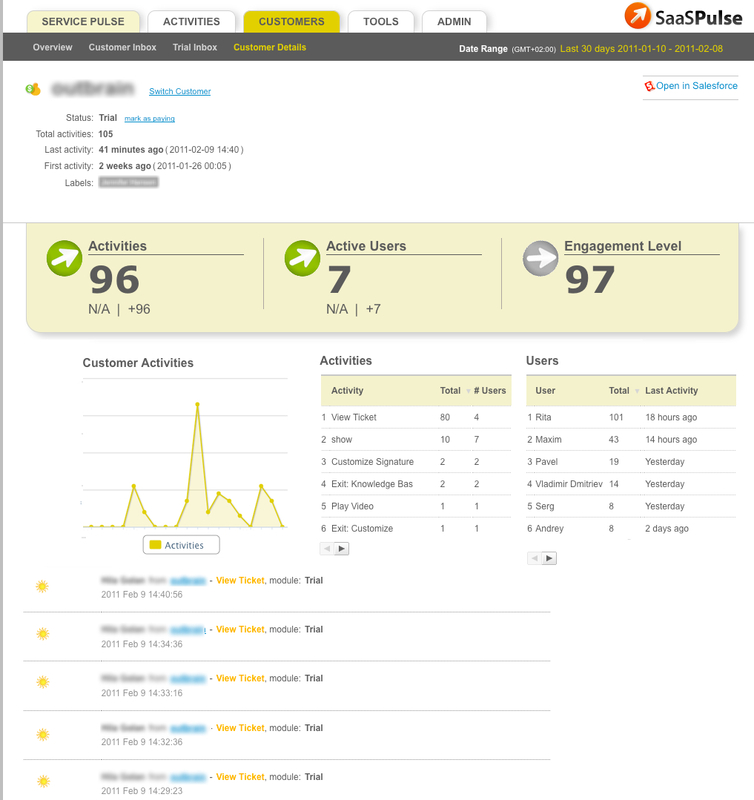 The top of the page shows key metrics such as the active users, new trial sign-ups and the top activities users are performing today. This global view of the service is extremely valuable for emerging services trying to get a better feel on the value their customers are getting from the service. Established services can use it to build an understanding of how new or changed functionality is being received. As is sometimes the case with global views, it can get noisy. That’s why our activity stream allows you to drill down to an individual customer’s activities. Clicking on any customer in the global stream drills down to an individual customer’s usage. Here we see key metrics on a specific customer: the amount and breakdown of activities, when they started using the service, when they used it last and so forth. Activity streams are a great tool to understand customers. Often, seeing the stream of their own activity data is when our customers get their first “a-ha” moment. The visualization helps them realize the full potential activity data has on improving their business, even before more advanced functionality like scaling trials and improving customer satisfaction. It’s all about increasing customer life time value but it starts with simple visibility, which is what makes Activity Streams such a popular capability of our product and why we plan to continue to improve it. Want to get personal with your customers?